Once you downloaded the bot template, installed it, you should find a new project template in visual studio. You can choose a project name, click Ok and you will end up with an echo bot that repeats what you say. Now, lets inject the Bot Service into asp.net core middleware. This will basically create an endpoint that will accept post requests sent to /api/messages . Open startup.cs file and in Configure method, add the following line. Don’t forget to remove the default middleware that print hello world. Now, our solution is ready to create a new Bot. Create a new class and name it EchoBot. Make it inherits from IBot interface and implement the OnTurnAsync. This is the method that get called when its your bot’s turn to speak to the user. This is a very simple bot that does nothing but echo what you say. To send a message to the user, we use the TurnContext.SendActivtyAsync. Note that activity is any thing (message, voice, card ..) going between the user and the bot. The bot is ready now to accept chat requests. Press F5 to run your project. It will open the browser with a new windows that tells you that no page can be found. This is normal as we didn’t inject any middleware to handle the root URL. In the SDK template, it uses static HTML file under wwwroot that has an introduction to the service. But this is not mandatory. To test the bot, we will need a channel to talk to it. Microsoft released the bot emulator for that purpose. 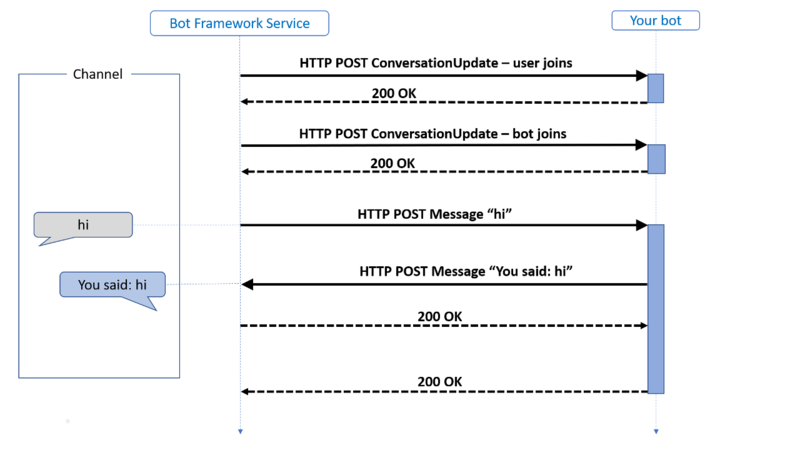 It allows you to connect and chat with your bot without deploying it to Azure Bot Service. The current emulator version is 4. But for some reason, it just does not work with me for local bots. It needs the bot to be deployed to Azure or at least create an Azure Bot Service and configure the Bot URL to be your local bot. You will expose the bot to Azure using ngrok. Another option is to just use Emulator V3 which you can easily provide the Bot URL which takes the format http://localhost:PORT/api/messages. Download the Bot Emulator V3 from here and install it then run it. On the top, add the URL for your Bot in the format mentioned before and hit enter. Start playing around and enter any message and you should receive the reply with: Hi, You said: YOUR_MESSAGE. You can check if the activity type is ActivityTypes.ConversationUpdate and then check the turnContext.Activity.MembersAdded property and use that to send a message to welcome the new members. ex: John has joined the conversation. When your bot encounters an issue or unhandled exception, you can catch that exception through an error handler. You can configure that in the ConfigureServices method when you call the AddBot method. The Startup.cs should be as below. We utilise the OnTurnError handler to send a message to the user informing him/her that something went wrong and log the exception. The emulator that comes with SDK V4 uses a .bot file that describes the bot, the services that the bot uses and the URL where it runs. The content of the file is self explanatory but the most important details are the name and endpoint. This is what tells the Emulator how to reach your bot. That will be the end of our post. In the next post, we will talk about the state management. If you didn’t read the previous post, please do. 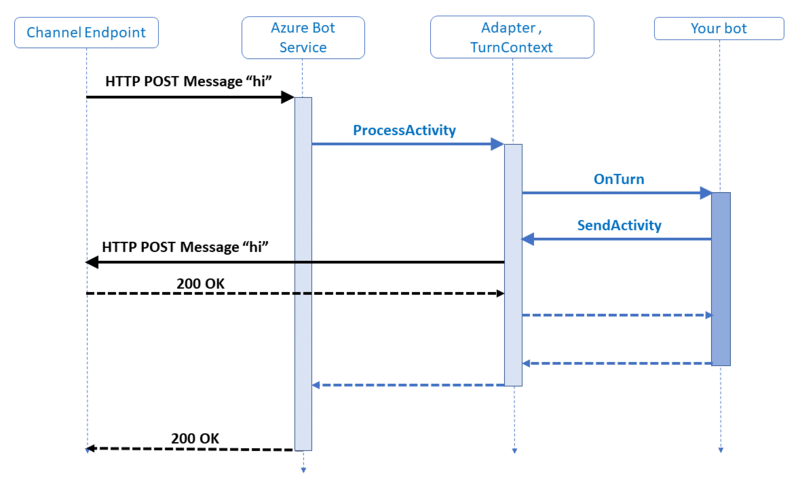 Today, I started learning Azure BOT Service, I will summarise each section into a blog post. A BOT is a modern way of user interaction. Instead of user clicking buttons and typing data in text fields, the user will be chatting or talking to an application that will understand the human language and respond accordingly. This of course increase the human interaction with your site or application and also decrease the need for employees to handle user requests. Imagine a user who wants to know about car insurance quote, instead of calling the insurance company, they can chat with the bot or even call it and ask them about the prices and the bot can respond as if it was a human or delegate the call to a human if it is not able to assist. This can save a lot for the company. Users interact with the BOT through a channel. A channel can be DirectLine like the case when you chat directly with the BOT from web site. It can be Facebook Messenger, Twitter, or any other popular social media platform. The chat between users and BOT can be a text messages, a card that display graphic content to the user or a voice message or even an interactive form that ask the user to enter some information like SSN or Policy Number. 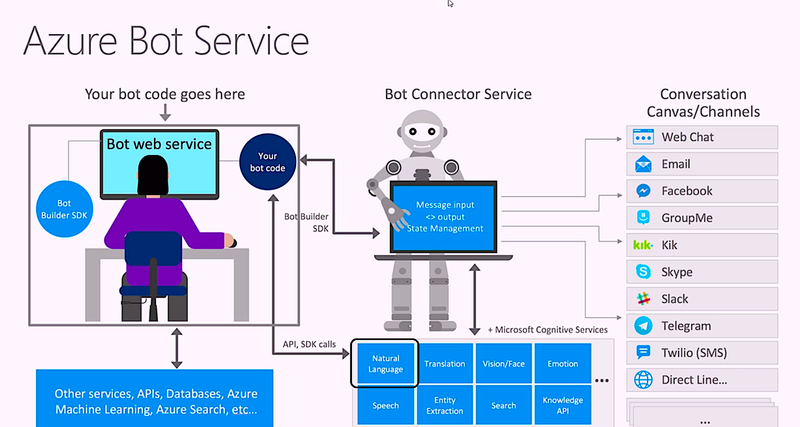 BOT can also use AI services such as Azure Congnitive Services to make it smarter. The communication between the BOT and Users/Channels take place through HTTP Post requests. When a user joins a conversation, an HTTP message is posted to the BOT service and the BOT just acknowledge the message with 200 OK response. Then, the BOT joins the conversation and again another HTTP Post message is sent to the channel and the channel replies back with a 200 Ok. These messages are called ConversationUpdate messages. All these messages between the BOT and the channel are called activities. During the ConversationUpdate activity, you can check the members added or removed. Once the connection is established, the messages send from the channel to the BOT are sent as an HTTP Post requests and the BOT replies back with a different HTTP Post not via response to the original HTTP Post request. So, as you can see from the image below, the Channel sent a Hi message, the BOT just echoed the message but it can send a different message. Then, the channel confirmed with a 200 Ok to the BOT and finally the BOT replies back to the original hi message with 200 Ok.
With the current version (4) it may not be very clear about the HTTP post messages but if you tried with the older version (3), it was very clear and when you create a new project you can clearly see an API controller called MessagesController and you can access it via /api/messages. Humans talk one at a time, one talk and the others listen (At least this is what should happen 🙂 ). which holds information about whose turn and what data was sent (Typically JSON) and the middleware which holds some components that execute in order to do something with the activity received. After all middleware components finish execution, it passes the control to the Turn Handler which will execute the application logic that will decide the response that will be sent to the channel/user. The middleware is executed on the incoming activity received from the channel and also on the outbound activity sent from the bot to the channel itself. In these series of posts, I will explain the internals of Azure Functions and how it works. By the end of it, you should be able to understand what happens once an Azure Function is deployed till the moment it is triggered and invocation completes. Is it a Web App? Yes, every Azure Function App that uses .Net as a Language runs as as.net core web app. When the app starts, it loads all your functions and proxies and set up the routes and listeners for each function. data: This folder contains another folder named “functions” which has another folder called extensions. The extensions folder has a list of all extensions installed to your Functions App. Each file has a reference to a nuget package that has the extension implementation. In Azure Functions 1.0, it was running on .Net 4.6 and the runtime already included all the supported triggers and bindings. But, with version 2.0, the runtime only includes http and timer binding and all the other bindings can be developed and installed separately using extensions. This allows you to develop your own extensions and upload it without the need to wait for a new version of Azure Functions. As you can see, there are 3 folders. Each folder represent a single function. All DLLs for each function exist in the bin folder. Inside each function, there is a function.json file that has the configuration for this function. The Azure Functions run-time use this file to load the metadata for each function during application startup. The most important properties are the scriptFile which points to the DLL that has the code and the entryPoint that has the exact c# method name that will be executed when the function triggers. The configurationSource specifies where to read the function configuration such as connection strings for the blob storage or service bus. attributes means it will be retrieved from code. The binding key lists all bindings for this function. For this sample, it is a timer and it is the trigger, so it has a single binding. For others, it can be bindings that represents input, output and a trigger. In the next post, I will explain the internals of each function, and how the bindings and triggers works. Azure functions enable you to quickly build a piece of functionality that can be triggered by an external system such as Azure Blob Storage, Storage Queue, CosmoDB, Event Hub and the list goes on. In this post, I will explain how Azure Blob Trigger works. The secret lies in the attribute [BlobTrigger]. It accepts the path to the storage container which Azure Web Jobs will monitor. As you know, Azure Functions is based on Azure Web Jobs, so the same triggers are used. How Azure Web Job knows about a file that is being added, updated or removed to a container? Run the sample app you just created in visual studio, it should work on the local storage emulator. Now, you should be able to invoke the function by creating a blob container called samples-workitems in your development storage account and you should end up with the following structure. You can see the container “samples-workitems” which Azure Web Jobs will monitor and invoke the function whenever a file is changed there. But there is also another container named “azure-webjobs-hosts” which is the secret for how Azure monitor the files in that container. If you opened that container, you will find a folder called “blobreceipts” which has a folder for the function name. These strange names are the ETag of each blob file added, edited or removed. So, when you change a file in any container, Web Jobs will create a new folder here with the new version ETag for that file and inside this folder you will find the same structure of the file being edited. In our case, there should be a folder called samples-workitems and inside this folder the file that was modified. When a new file is added, Azure will check if its ETag exist in the azure-webjobs-hosts folder and if not, then it will call the Azure Function. This way it will prevent duplicate calls for the same file. This pattern is called blob receipt. Note that this process depends on Azure Blob Storage Logging which can take up to 10 minutes to write to the container azure-webjobs-hosts to improve performance. If you need your function to trigger faster then consider using Storage Queue trigger instead.